The Lung-MAP ("Lung Cancer Master Protocol") trial is a precision medicine clinical trial that opened in June 2014 to patients with advanced squamous cell lung cancer, a type of non-small cell lung cancer (NSCLC), whose disease has progressed after treatment with chemotherapy. The trial uses genomic profiling to match patients to one of several investigational treatments that are designed to target specific genomic alterations in their tumor. 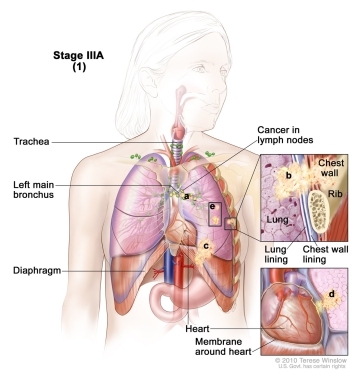 Originally open to patients with squamous cell lung cancer, the trial's eligibility has recently expanded to include patients who have progressed on immunotherapy with all types of NSCLC. NSCLC represents approximately 85% of all lung cancer diagnoses in the US. The trial will screen up to 1,000 patients per year and is offered at more than 650 U.S. medical centers and community hospitals under the NCI's National Clinical Trials Network (NCTN) and the NCI Community Oncology Research Program (NCORP). Patients whose tumor does not match any of the genetic alterations that are being tested in the trial may join a sub-study to receive immunotherapy combinations. Two new sub-studies are in development and will open in 2019. Lung-MAP is being funded and implemented through a unique public-private partnership among NCI, Friends of Cancer Research, SWOG, which is a member of NCI's National Clinical Trials Network, the Foundation for the National Institutes of Health, and five pharmaceutical companies. A January 2019 press release from SWOG and Friends of Cancer Research provides further details on the trial's eligibility expansion.